Hint: no, it's not GPS tracking; yes, you do have to link your contact info to the unique microchip number by registering it*. 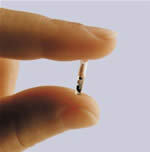 A veterinarian's article on why you should microchip your pet. * Don't forget to register your pet's microchip for FREE at the Found Animals Registry. Taos Tack and Supply 575-737-9798 offers the dog 5-in-1 parvo/distemper vaccine for $10.50 + tax, and Blue Sky Pet & Feed Supply 575-758-1841 offers it for $9.50 + tax, but you must administer it (syringe & needle provided). Taos Tack: 710 Paseo del Pueblo Sur, Taos 87571 or Blue Sky: 214 Paseo del Pueblo Sur, Taos, NM 87571. (1) The Humane Society of Taos aka Stray Hearts Animal Shelter 575-758-2981 is NOT currently offering low-cost microchips and vaccines to the public. Standard pricing at Stray Hearts is $10 per vaccine and microchips* for $20. Dogs should be on leash, and cats in secure carriers. (2) The Española Valley Humane 505-753-0228, 108 Hamm Pkwy, Española 87532 has vaccine clinics every Tuesday from 9am-1pm, walk-in. $12/vaccine for animals that are fixed (already spayed/neutered), $30/vaccine for unaltered pets with breeder's permit. Microchips* are $20 (unless with spay-neuter surgery, then it's free for cats, $10 for dogs). Dogs should be on leash, and cats in secure carriers. Reminder: dog & cat vaccines are FREE when done at the time of spay-neuter, & microchips are FREE for cats if done at the time of spay-neuter. The dog parvo-distemper vaccine and rabies vaccine are free if the client opts for them. The microchip is $10 if the client opts for it. The dog parvo-distemper vaccine and rabies vaccine are free if the client opts for them. The microchip is free if the client opts for it. Standard vaccine pricing at the Salazar Rd. Vet Clinic is ~$25 total for parvo/distemper & rabies, while it is ~$43 at the Taos Vet Clinic. No exam fee when combined with your spay-neuter appt via FCAL. Cat vaccine(s) done at the time of cat spay-neuter at the Salazar Rd. Vet Clinic via Taos Feral Feline Friends or Zimmer Feline Foundation are free, and you will not pay for an exam fee. Cat vaccine(s) & microchip done at the time of cat spay-neuter at the EVHS are free if client opts for them, and you will not pay for an exam fee. Cat vaccine(s) done at the time of spay-neuter are free by Planned Pethood Taos, and you will not pay for an exam fee.